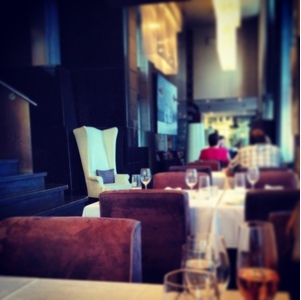 Passing through the downtown core, I have noticed once or twice a trendy little spot across from the Bell Center. 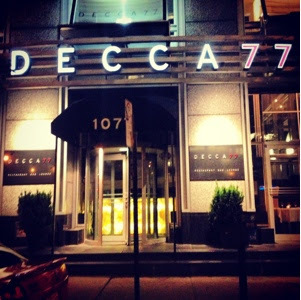 Decca77 has been around for awhile, but I never thought of or had the chance to pass by and try it out. About a week ago I was invited to sample their menu and try out what their new chef Jean-Sébastien Giguère, a former member of the staff at Toqué! has to offer. I gladly accepted the generous invitation and boy was I not disappointed. I have to say, this was the first time I had ever gone to a restaurant or been invited to try a menu and not had a single complaint - seriously did not expect this! Arriving a little early for our reservations Christophe, the general manager, graciously sat us at a table in their "in-between" section and offered us a bottle of champs (champagne for those not into my crazy lingo). Let me start by explaining that there are two menus and two sides to Decca77. They offer a Brasserie menu, using the same high quality ingredients as the upscale restaurant side, but at a lesser cost to consumer. 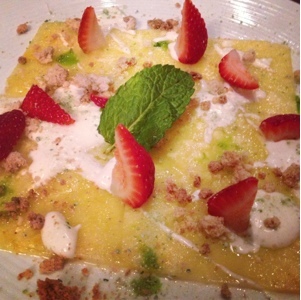 Both menus are extravagant and offer delicious and fresh dishes that would please any palate. Both sides of the restaurant are decorated beautifully and appropriately to their individual concepts - I loved the exposed wood table on the Brasserie side. Now back to the champs. I am not a champagne lover, normally the sweetness gets to my head in seconds, however Christophe must have read my mind and served us a deliciously dry and bubbly champs - so good and pink too! 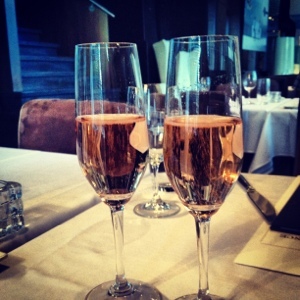 As we sipped our bubbly, Christophe offered us the options of ordering off either their Brasserie or Restaurant menus or a tasting menu created by chef Giguère. One of my fellow dining partners chose to order off the Brasserie menu, while myself and another decided on the tasting menu - oh so good! 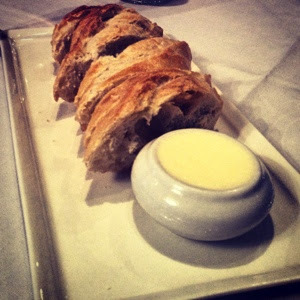 After our decisions were made, a delicious plate of bread arrived to keep us company while we waited for the tasty samplings from the kitchen. As we sat drinking and munching on a fresh baguette, our first course arrived. 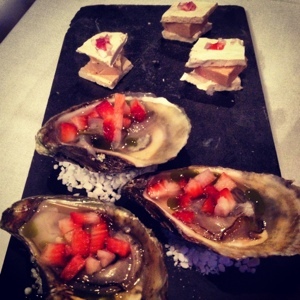 An "amuse-bouche" platter of oysters topped with diced strawberries and little foie gras sandwiches were set in front of us and I for one could not wait to dig right in. 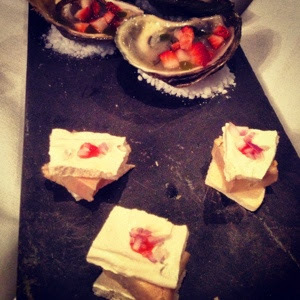 I am a huge oyster lover but have never had them served with diced strawberries. Needless to say this dish was light and sweetly flavoured by the strawberries. I thought they paired perfectly and truly complimented one another - it also helped that they used really fresh and meaty oysters. The little foie gras bites were served on strawberry "waffles" that had more of strawberry meringue texture. These tiny little bites had so much flavour - absolutely delicious. The mild strawberry sweetness blended beautifully with the creamy and delicious rich flavour of the foie gras, I really wished that there were more of these tasty bites on the plate - so good. 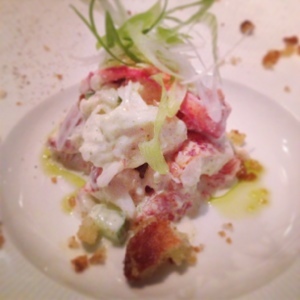 When I scanned through the menu earlier, about fifty times, I noticed one dish that I really wanted to try - Lobster salad! the chef must have read my mind because the next dish I saw heading over to me was a beautifully presented plate of lobster salad, needless to say I couldn't wait for my first bite. The lobster meat was cooked to perfection, tender not tough, buttery not pasty, just sweet delicious lobster. A light spiced mayonnaise dressing flavoured the lobster meat, and shavings of endives and chopped celery completed this truly enjoyable dish. I especially liked the crispy crouton pieces sprinkled onto the plate, they really created a delicious contrast in textures. We enjoyed it so much, that we mopped up all the leftovers with the remaining pieces of baguette. I really was upset when I had finished the dish, I almost asked for a second. While the two of us scarfed down the Lobster salad, my friend was presented a delicious smoked salmon and arugula plate. 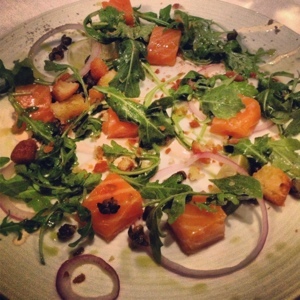 Instead of thinly slicing the smoked salmon, Chef Giguère chooses to present his smoked salmon in beautiful chunks sprinkled with a generous portion of arugula, crouton crumbles and red onions. He then finishes his dish with a light sprinkle of olive oil and some spices - absolutely delicious! We loved that the salmon was presented in chunks, it was easier to eat and a nice change to a classic dish. The house made smoked salmon was absolutely perfect, fresh, flavourful and delicious, we couldn't get enough. Even though I loved my lobster salad, I wished I had also ordered a plate of the smoked salmon. We sadly let our plates be taken away by the attentive staff, and prepared ourselves for the next course. We switched from champagne to white wine, a chardonnay I believe, and then came the pasta. Two bowls of cavatelli in a mushrooms cream sauce arrived at our table and we dug right in - of course another plate of bread appeared! The sauce was a cream sauce, but it was not heavy and thick rather light and really flavourful. 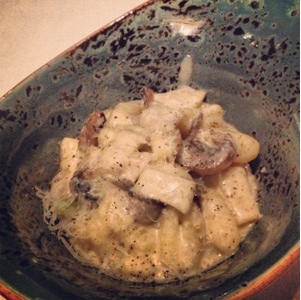 The mushrooms and pasta were both cooked perfectly, not over cooked nor mushy - a really great pasta dish! We let our other friend try some before realizing that she had actually ordered this dish as her main course. Needless to say when she got her plate she was more than thrilled and gobbled up every last bite. Our pasta course was cleared away and it was time for our mains. 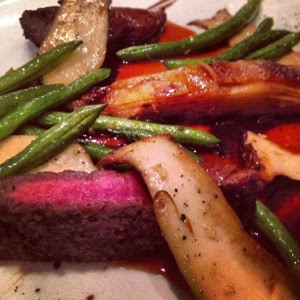 A beautiful plate of grilled beef filet, king oyster mushrooms, green beans and "Pomme de terre Boulangère" drizzled with a red wine bordelaise sauce was set in front of me. As I looked at this deliciously presented plate, I knew I was going to enjoy each and every bite, to my surprise I finished the entire plate. The mushrooms were delicately place and cooked leaving their delicious taste and texture to shine through. The "Pomme de terre Boulangère" were tender and soaked up the delicious flavours of the plate - loved how they were presented. The bordelaise sauce went beautifully with the potatoes as well as the beef. The tender slices of filet were cooked medium rare and spiced just right. The sauce was a nice compliment to the meat, although I thought the beef was flavourful enough on its own. The green beans were tender yet crisp and added not only a delicious contrast in textures, but served as the perfect sponge to soak up the red wine sauce - deeelicious! My tasting menu partner loves meat but her body won't allow her to eat it, so she was served a delicious plate of mackerel as her main course. We all tried and really enjoyed this dish. 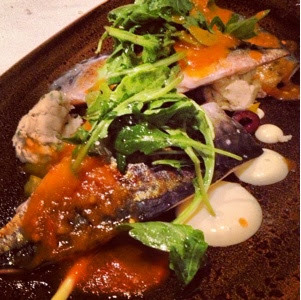 Three beautiful and perfectly cooked filets of mackerel, tender and flaky, spiced with a spicy smoked paprika and served with a smoked white fish salad and dusted with some baby arugula - heavenly. The spicy mackerel was so good I ended up eating an entire filet - Yes I over ate but it was totally worth it. The white fish salad was mildly flavoured but delicious. I knew it was made properly as there was no hint of fishiness that normally turns me off this dish. Two sauces accompanied this dish, both delicious and lightly flavoured as to not take away from the fish. To be honest, the dish was so good and we ate it so fast that we all don't remember the flavours of the sauces - oopsies! We finished our wines, sat for a few minutes and then dessert arrive; a chocolate lava cake served with fresh sliced strawberries and a gorgeous plate of pineapple carpaccio. We all reached for our forks and dug right in. I have to admit, at first bite I did not like the lava cake (too cakey), however as I took my second bite my mind quickly changed. 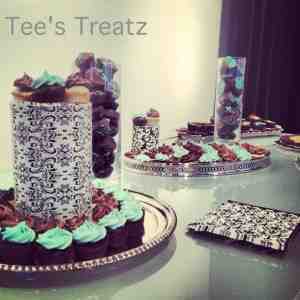 The delicious oozing dark chocolate center was my favourite part. 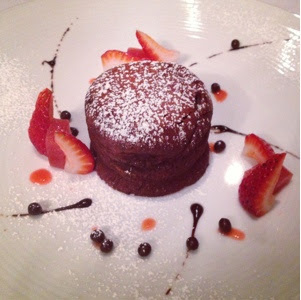 This dessert is not an overly sweet chocolate cake, but rather more of a semi-sweet dark chocolate - loved that! The pineapple carpaccio plate was stunning, so beautifully presented that we were hesitant to dig in and eat it - but we did anyways! The fresh strawberries, sweet pineapple and delicious crumble (and the sauces - coconut and rum I think) complimented each other perfectly. The blend of flavours on this plate were very refreshing and the perfect ending to a rich and delicious meal. As our table was cleared, we sat and talked about the meal we had just finished. We all agreed that Decca77 is one of our new favourite dinner spots and couldn't wait to come back and try some more of what Chef Giguère has up his sleeve - Probably going to be our first spot for Burger week! I can't agree more! Decca77 was beautifully delicious!! I know!! I'm going back for more! 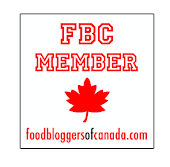 Want to try their burger for burger week!! !